EMMANDUS INSPIRATIONAL NETWORK! : EASTER SUNDAY:BEHOLD HE LIVES! It's a wonderful day. Easter season Greetings. . I bring you the message and full chapter on the resurrection of Our Lord Jesus Christ,It is the greatest news ever..
3-10 Peter and the other disciple left immediately for the tomb. They ran, neck and neck. The other disciple got to the tomb first, outrunning Peter. Stooping to look in, he saw the pieces of linen cloth lying there, but he didn’t go in. 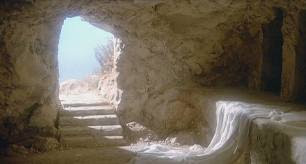 Simon Peter arrived after him, entered the tomb, observed the linen cloths lying there, and the kerchief used to cover his head not lying with the linen cloths but separate, neatly folded by itself. Then the other disciple, the one who had gotten there first, went into the tomb, took one look at the evidence, and believed. No one yet knew from the Scripture that he had to rise from the dead. The disciples then went back home. 13-14 “They took my Master,” she said, “and I don’t know where they put him.” After she said this, she turned away and saw Jesus standing there. But she didn’t recognize him.